Michael Kors makes GORGEOUS watches, and a lot of people are loving this purple version at the moment. It retails for $195 at Zappos. 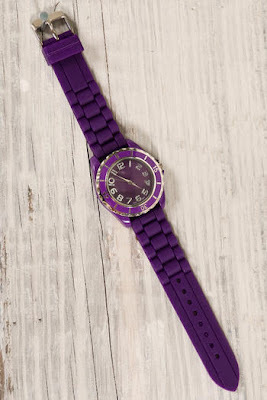 If you've been eyeing this purple watch but don't want to throw down so much cash on a trendy item, check out this similar option from Francesca's Collection. It clasps differently than the MK version but for only $18, who cares? Click here if you're interested in purchasing.